We consider testing for structural change in a dynamic linear regression model, and show that the well known CUSUM test, which has been initially devised only for the standard static model, can easily be modified such as to remain asymptotically valid also in this nonstandard situation. 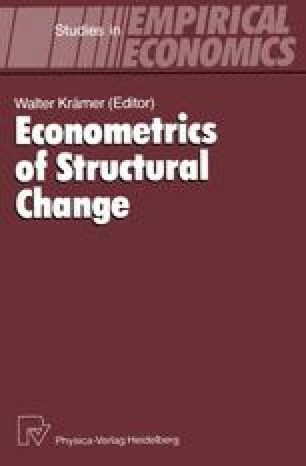 Preliminary versions of this paper were presented at the first meeting of the IIASA working group on “Statistical and Economic Identification of Structural Change” in Lodz, May 1985, at the Econometric Society European Meeting in Budapest, Sep. 1986, at the annual meeting of the econometrics section of the “Verein für Socialpolitik” in Gießen, March 1987, and in seminars at CORE, Manchester, Rotterdam and Amsterdam. We are grateful to G. Chamberlain, J. Drèze, S. Dutta, P. Hackl, A. Harvey, J. Kiviet, T. Kloek, H. Lütkepohl, B. McCabe, G. D. A. Phillips, R. Quandt, and in particular to Wang Liqun, for helpful criticism and comments. Any errors remain our own. W. Krämer acknowledges financial support from the Deutsche Forschungsgemeinschaft. All computations were done with the Institute for Advanced Studies’ IAS-SYSTEM econometric software package.